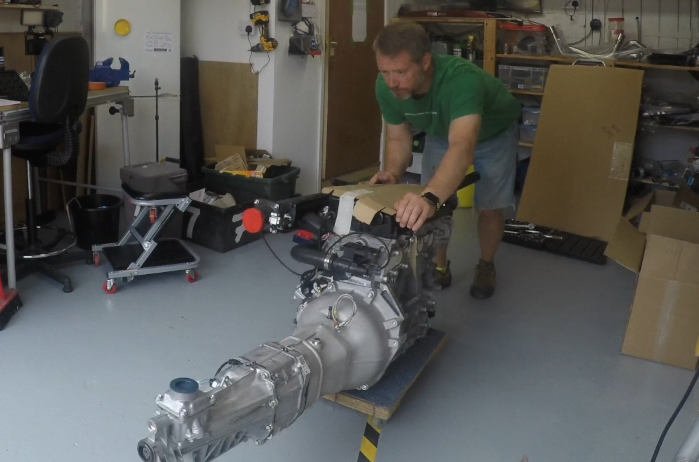 Big day today, big post… we have a whole day (August Bank Holiday Monday) to drop the engine into the chassis. Will it fit? Will the hoist tip over? Will the leveller work? Will my trolleys work? Will my leveller extensions work, or even come loose and drop off? Will I be able to do most of it myself? And more importantly… will it rain? The weather is set to be dry and sunny all day, we have 4 GoPros and various cameras set up. So, the first jobs of the day are to get the cameras rolling and the car outside. At some point I hope to get some videos of the more interesting parts of the build up onto YouTube. There’ll be a link here in the future if that happens. Moving the car around like this is where the wheeled axel stands are really paying off. I’d have struggled for head room on the hoist with the car in the garage. Having the extra space around the sides with it out in the open helped us be more careful around the bodywork. 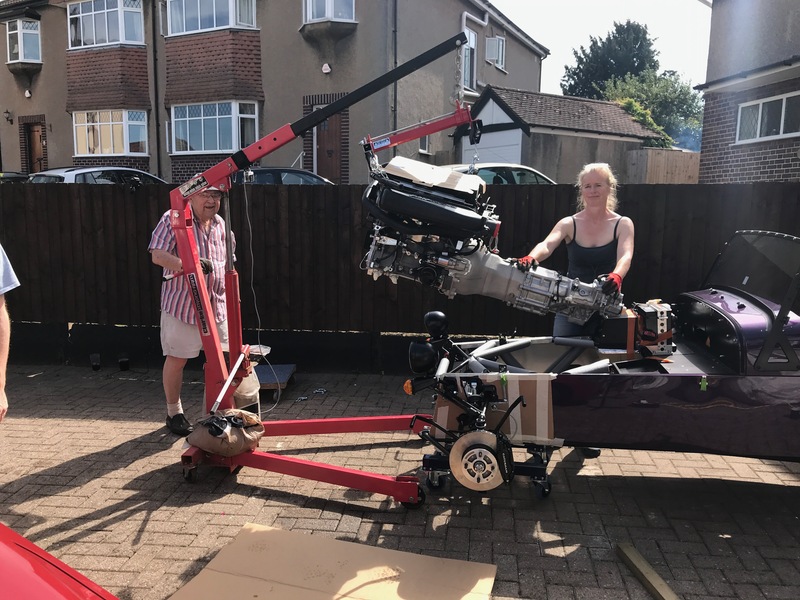 I’m not sure it helped in the time it took to get the engine in, but I felt a lot better having the extra freedom to move around and with more people around the car to help. Next up there was a little more prep required on the engine. In order to stand any chance of getting the engine into the car it’s advised that at least the alternator gets removed. I’ve also seen it recommended to remove the engine mount struts. As you can see in the image above, I’d written in white paint which way up and from which side each of the struts had come from. Which side is simple, one side has three bolts and the other has four – I spotted that as I painted up the second strut! I also made sure I stored the bolts in the threads they’d come from, so that I didn’t put a strut back on in the wrong configuration. There are a number of unused threaded holes in the engine block and I didn’t want the added confusion of wondering later, with the engine hanging in the bay, why the struts didn’t line up with the engine mounts. Maybe its not even possible to put a strut back on in the wrong place, but I didn’t want to test that theory this time around. 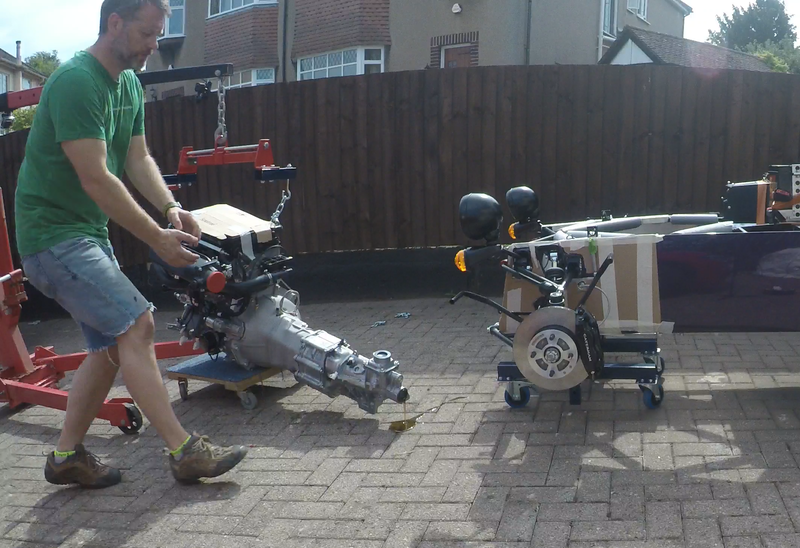 Again, having the engine on my homemade trolley was really useful. 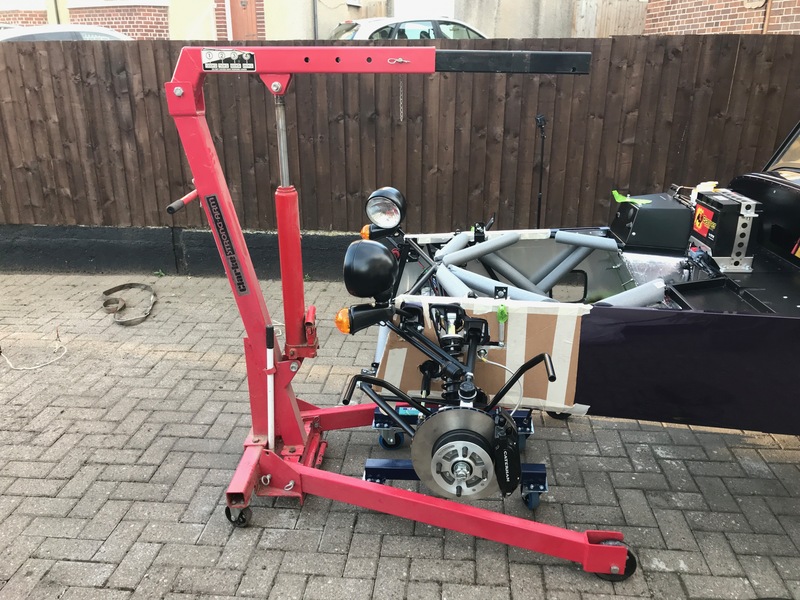 Especially at this point… but I’d also had to shift it around the garage a couple of times and doing so without this trolley probably wouldn’t have been possible without my own hoist. Handmade trolley for engine/gearbox… highly recommended! 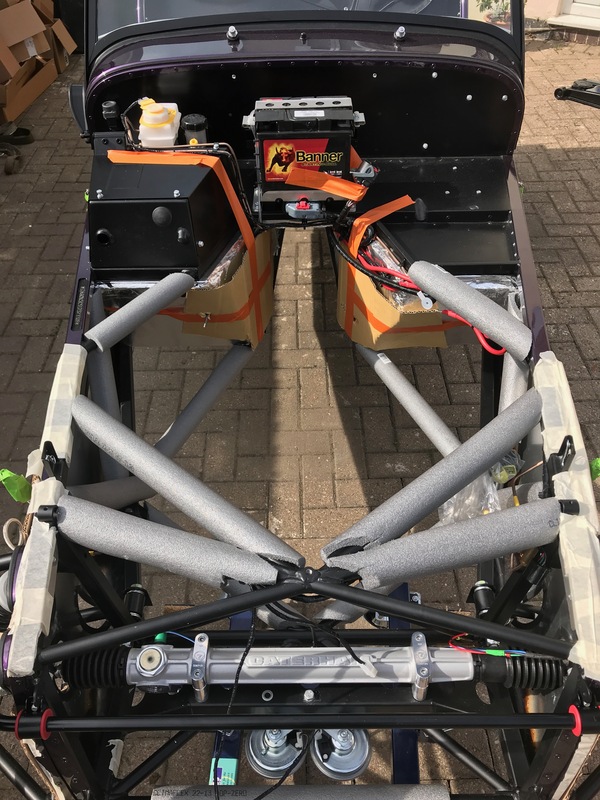 As well as the pipe lagging I’d installed onto the chassis rails, it’s also advised to protect the footwells and specifically the reflective heat protection covering them. The protective padding also runs down the transmission tunnel and I added cardboard to anywhere I thought could get banged up if a 100Kg pendulum hit it. 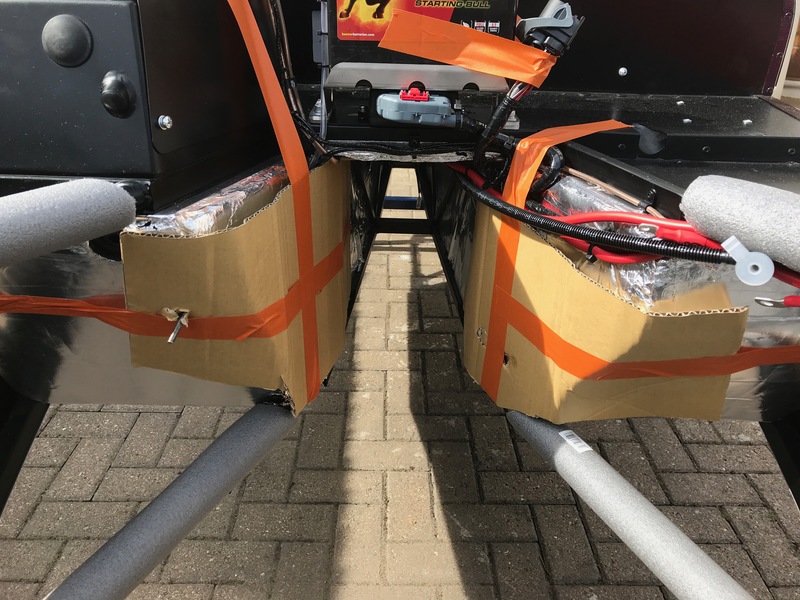 The cardboard’s not going to protect against a big impact but it would stop the padding from being ripped if the engine grazed it on the way past. Wider angle view of the chassis and footwell protection, will it fit! I think this gave us about an extra 5°. 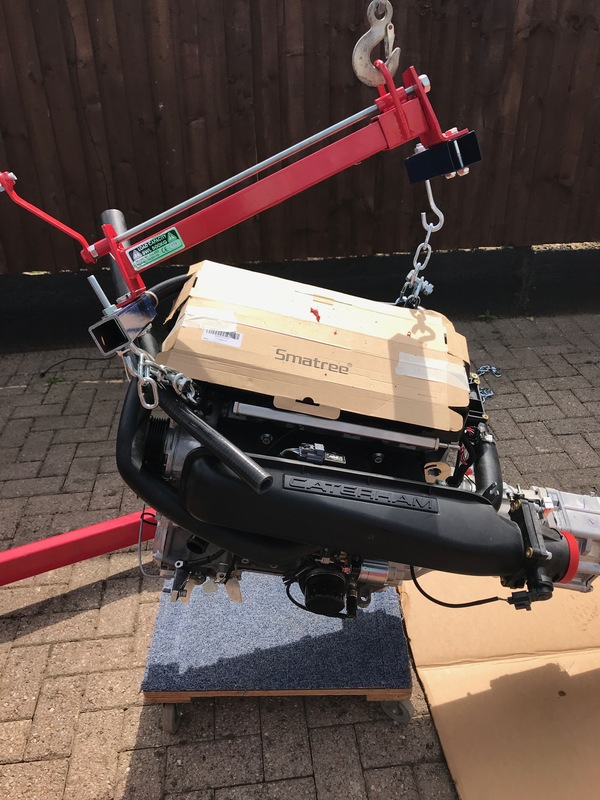 There was also the small matter of the hoist tipping when the engine and gearbox were lifted. While the whole arrangement stayed upright, it didn’t take much downward pressure at the engine to tip the whole thing forwards. I’d have thought only about 5Kg of weight (50N) was enough to tip the rig. We definitely needed to add some ballast. 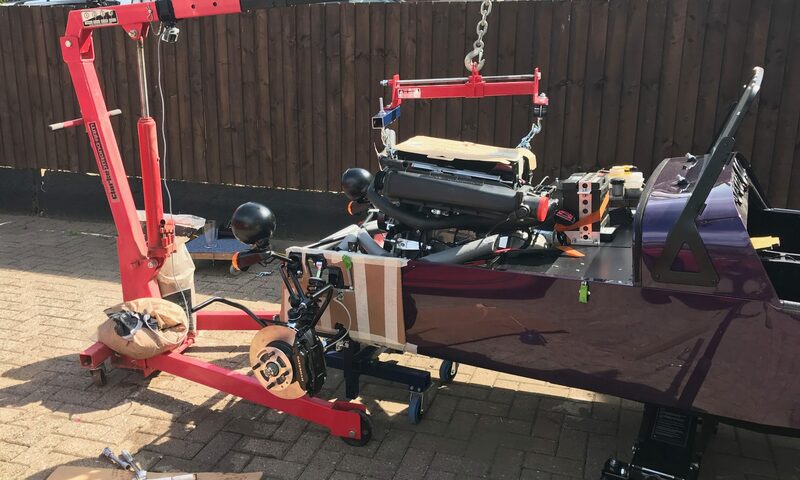 It was definitely going to tip as we moved the hoist over the pavers and put pressure on the rig as we operated the leveller and jiggled the engine around the chassis. The solution was simple… a couple of bags of aggregate/sand… and for a while we also had Ted standing on the back of the hoist as ballast while we found the aggregate bags! With the rig now properly stable we had various attempts at moving the leveller one way and then the other until we got the hang of it. 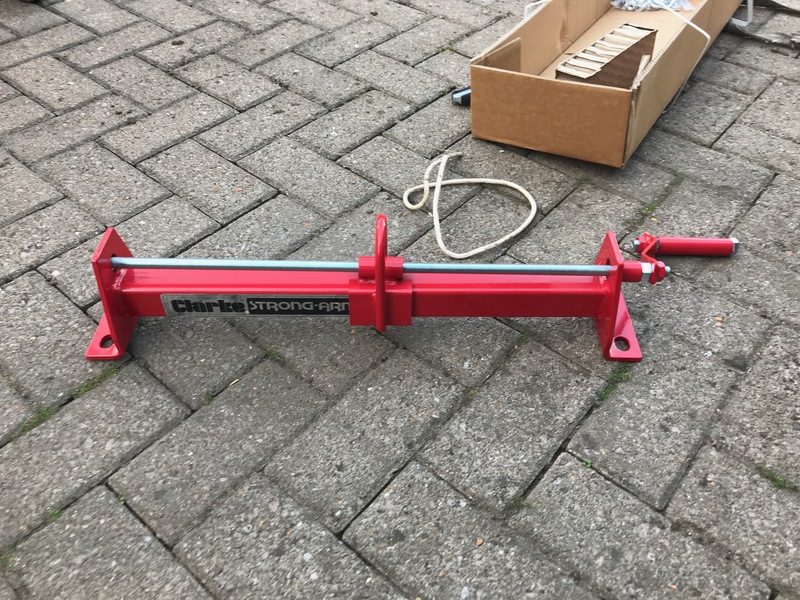 If I’d have thought about it some more when I was making my outriggers I’d have made them so they shifted the leveller backwards on the engine and moved the COG closer to the middle of the leveller. I also played around with the length of the chains attaching the leveller to the engine. I tried a few configurations but in the end I left them both about the same length. In the end I did get the leveller to work within a good range of its screw thread. 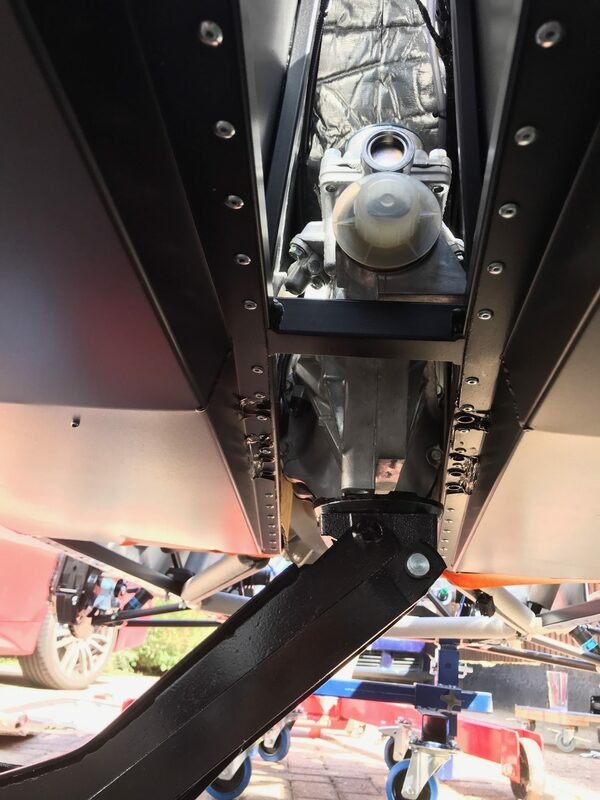 As you can see from the picture above… as the leveller centre hoop (attached to the hoist) moves left (towards the front of the engine) you can think that its pushing the rest of the hoist and engine to the right, therefore, dropping the gearbox. It was about at this time that I realized I’d made a schoolboy error. I’m sure the manual talks about removing the plastic plug from the back of the gearbox prior to the engine going in. 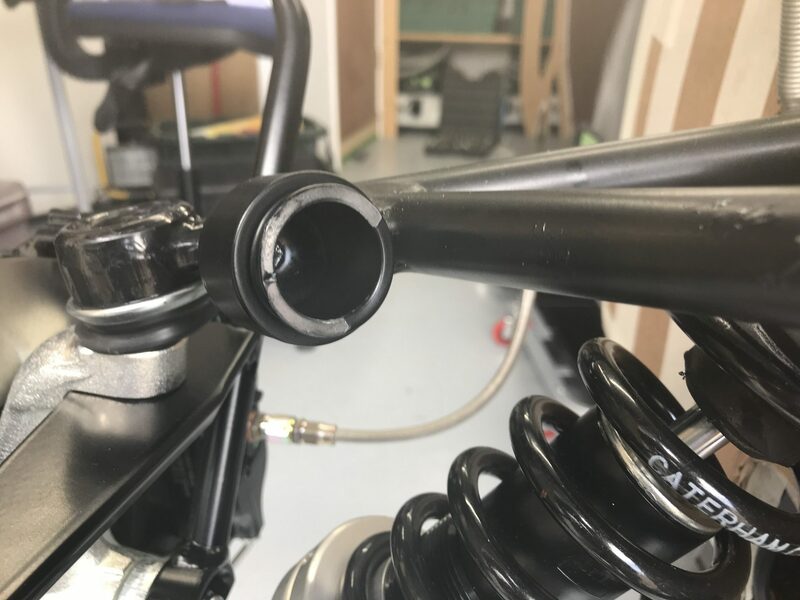 I duely did this only to find that once the engine was inclined to somewhere close to the angle I wanted to try and drop it into the car, all the oil from the gearstick reservoir drained out of the hole where the plug was – the hole where the prop shaft goes. I quickly put the plug back in, placed some cardboard under the engine and hoist (in case the plug didn’t hold as it was all tipped again), and had another go. Finally we got the hoist somewhere close to what we needed. 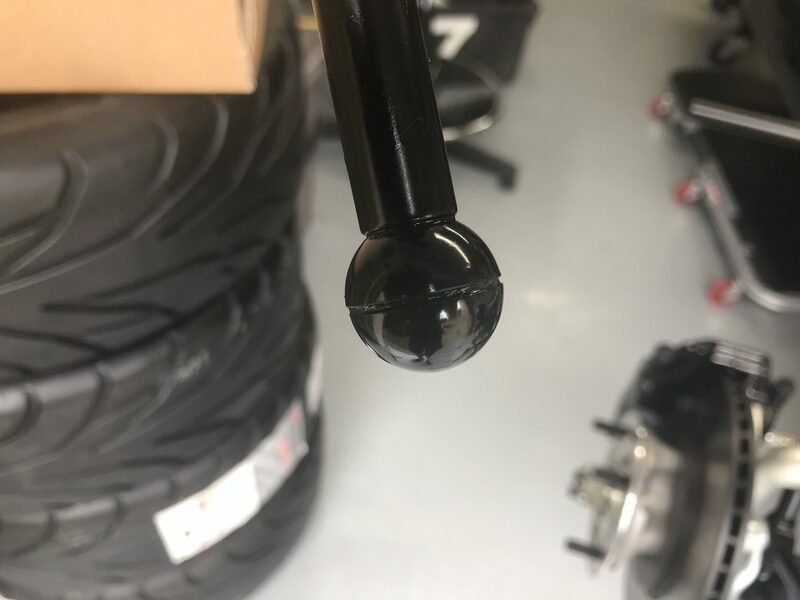 I’m not sure the leveller extensions did a great deal to remove the twist but I think we were better off with them than not having them. The engine was still twisted a few degrees clockwise (when looking from front of car) but in the end we didn’t have to worry about the rotation as it seemed to correct itself once the gearbox was supported on the trolley jack. All told I probably played around with the hoist for and hour or so. It was then that I was joined by Ted, from next door, Harry and Sue. We then had another go at getting the engine lifted and set at the right angle to go into the car. 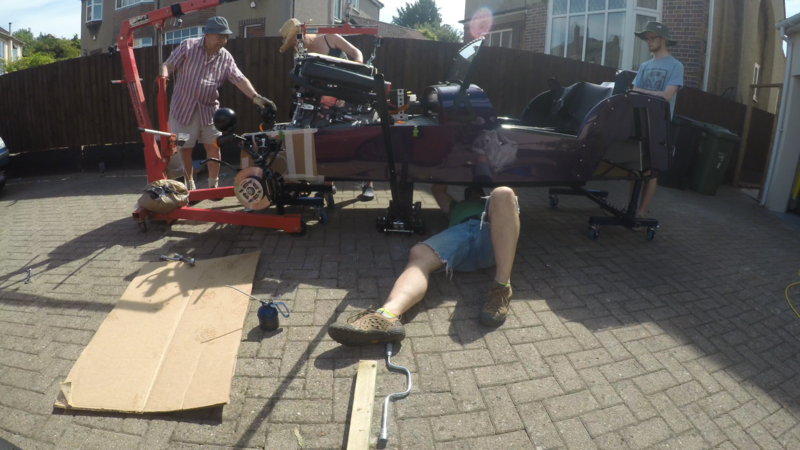 We then spent a couple hours (plus a lunch break) doing the engine, gearbox, hoist, leveller and car two-step. As others have described, its a case of a few centimeters forwards, a few centimeters down, a few centimeters forward, a few centimeters down, etc etc. One difference we had from many of the blogs I’ve read is that we were able to add another dimension to the dance. Because of the wheeled axel stands, we were able to move the car instead of the engine and hoist. The wheels on the hoist were steel and rattled and caught on the pavers we have for a driveway. The wheels on the axel stands were my swapped out synthetic wheels and they rolled much better on the pavers. This meant we could be much more accurate in moving the car than moving the hoist. Each jiggle forwards and down could be much more precise. Once we had the gearbox roughly inside the opening of the transmission tunnel we could introduce the trolley jack to the equation. As the gearbox was fed into the transmission tunnel we supported that end of the assembly with our trolley jack. It supported the gearbox but also seemed to straighten out the twist of the engine caused by leveller being oriented off the centre line of the gearbox and engine assembly (as discussed in yesterday’s post). The only really tight part of the process was the point where the front of the engine passes the LHS front diagonal chassis member. In the end we had to remove the pipe lagging and replace it with a piece of cardboard to protect the chassis. The engine then passed the chassis member by a few millimetres. Just when we thought it wouldn’t go any further we could either go down or back a few millimetres which would then allow us to move in the other axis again. When the engine was a few centimeters above its final home, it made sense to put the engine mount struts back on. 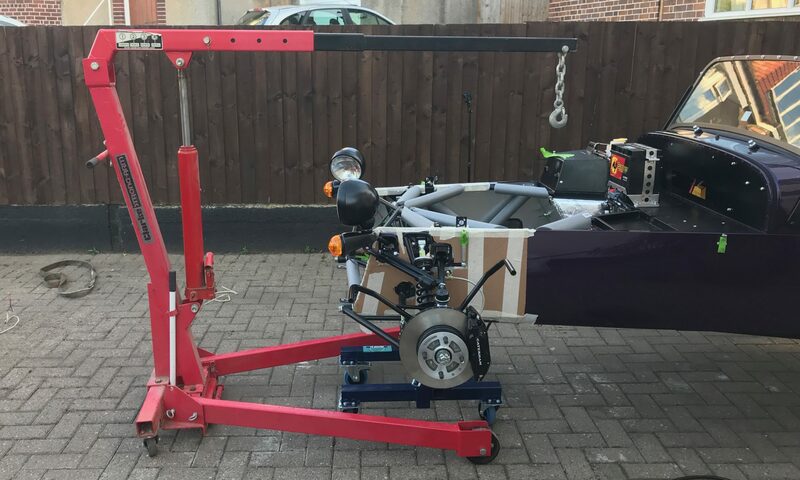 They can’t go in until you’re really close to the final location as there’s a vertical chassis member set close to the ending mounts (which of course needs to be there for structural integrity around the engine mounts). With the struts in place the engine can be lowered to its final resting place. The final few millimeters caused us some more concern. The gearbox was really close to the LHS transmission tunnel walls. It was touching the heat shrouding and very close to a chassis member. 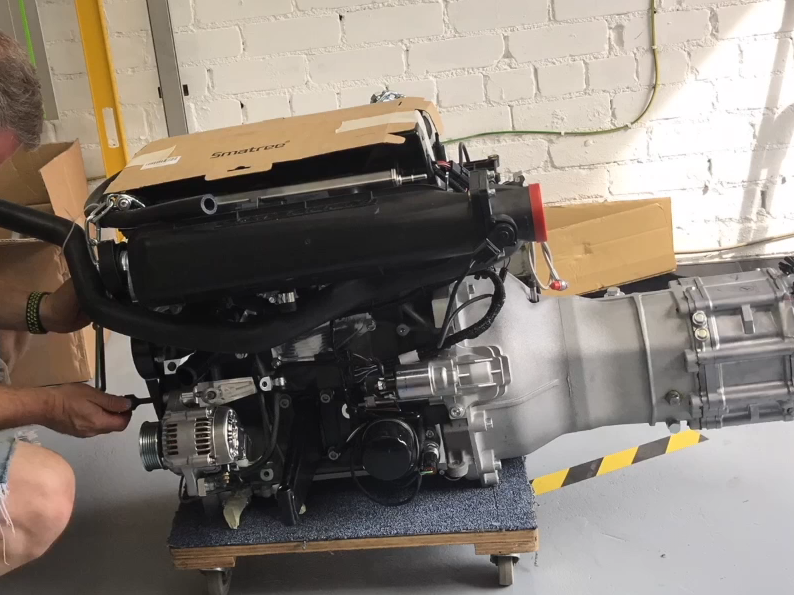 I know every blog tells of how close the gearbox is to the chassis but I couldn’t believe it was this close. Surely its going to contact the chassis under cornering?! Gearbox very close to chassis member. Refused to budge. 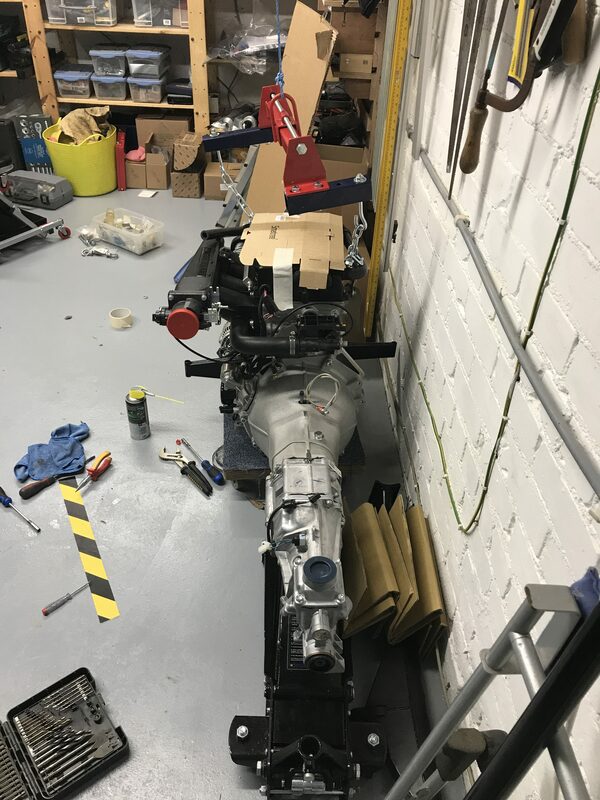 I attached the gearbox mount to the gearbox with the two large M12 bolts and used the two front engine mount M10’s to guide the engine into position. I torqued up the bolts at this point… but later… undid them again. The rest of the team had left by this point. We finally had all the engine mountings in place but they needed to be tightened and torqued. The front bolts were only loosely in place, finger tight and only a few threads on. I’d appreciated that a special imperial hex Allen key was going to be needed for the front engine mount bolts but I hadn’t got around to buying one. I’d assumed that I’d have something that would be good enough in my box of Allen keys. 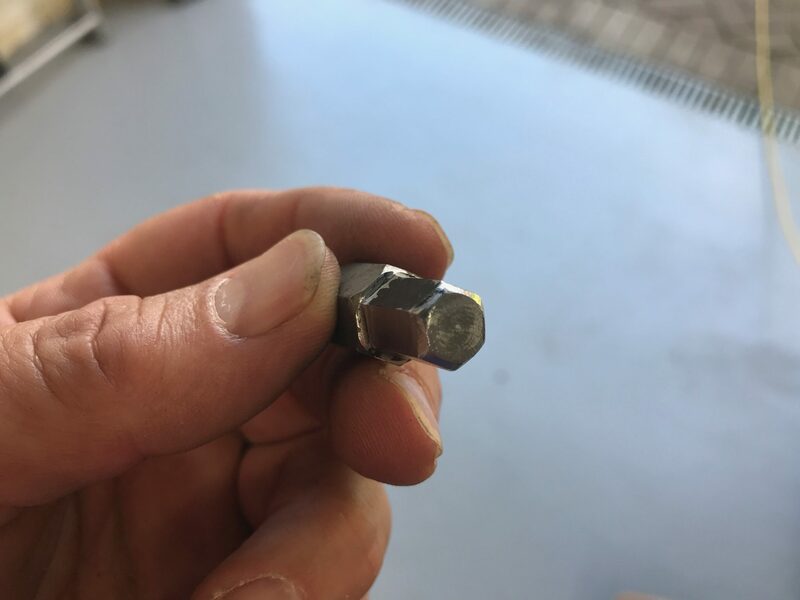 Nothing seemed to be quite right so I decided to grind a larger metric 12mm hex key, with a 1/2” socket connection, down to size. Out with the Dremel and 30 minutes later I had an imperial hex key. 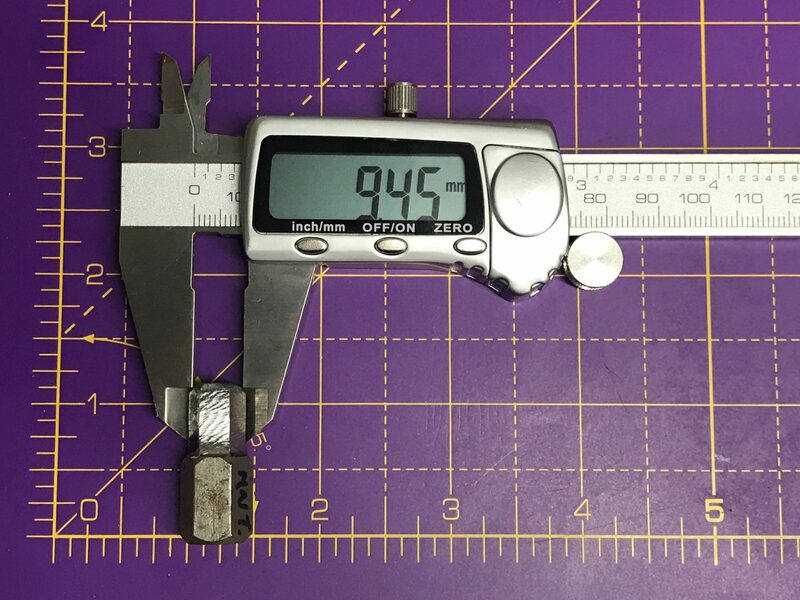 The calipers say its around 9.5 mm from flat to flat (how hex fixings are measured). It’s a little loose in the cap head but fine for the job. The manual talks about feeding the gearbox-mount-to-chassis bolts down from above and attaching the nyloc nuts from underneath – at least that’s how I read it. Instead, I decided to push bolts up from bottom and attach the nuts from the top. It didn’t seem to be any trickier to do it this way (you need to get a spanner on the top and torque wrench on the bottom) but the method to my madness was that with the nuts on top they would be kept out of the weather and therefore more likely to be removable if the time comes. The downside of this, of course, is that if a bolt comes undone it will drop out through the holes. 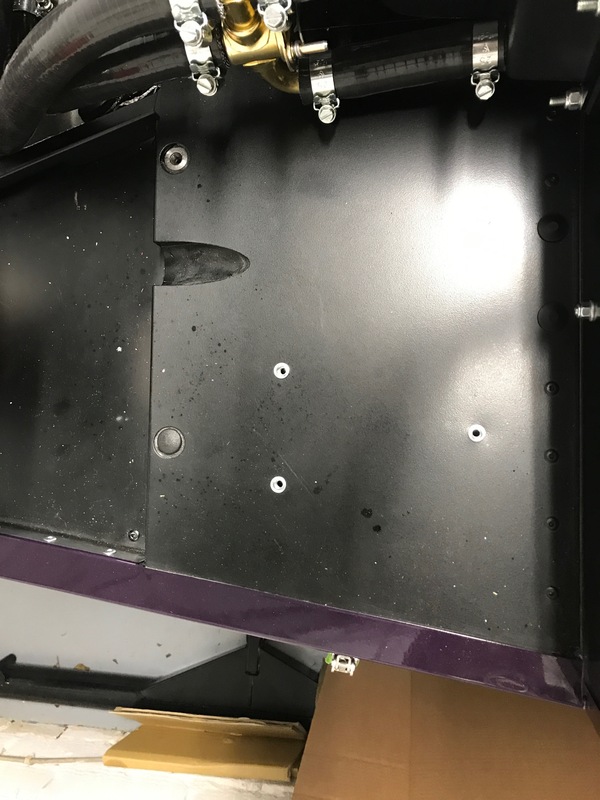 Firstly, I don’t think this is very likely and secondly, these bolts aren’t very expensive… I’m more concerned about them seizing than coming loose. The manual also talks about centering the gearbox in the transmission tunnel using the elongated holes (slots) in the chassis. As far as I could tell there was no play in the positioning of the gearbox in the transmission tunnel. 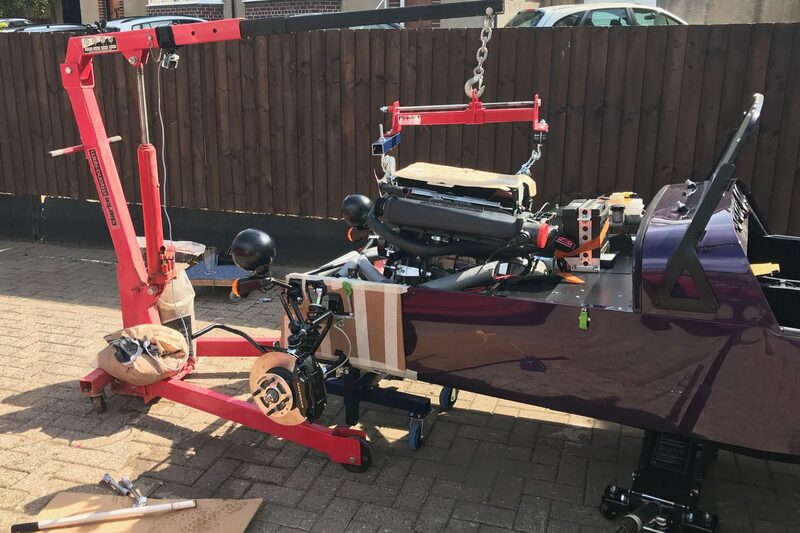 I left the front engine mounts loose, left the gearbox suspended on the jack and left the engine hoist in place to take all the loading of the engine and gearbox mounts. We then tried to “shift” the engine/gearbox assembly in the tunnel but with no effect. It resolutely wanted to sit close to, but not touching, the LHS transmission tunnel chassis. I even tightened all the engine and gearbox fixings at one point, lost confidence and undid them all again to try and move the gearbox over again. To no avail! At this point, the engine was in. We could have left it there and called it a day but I wanted to get the alternator back on before the car was put to bed. Ted came back round again to see how we were doing, so between us we had a look at getting the alternator belt back on. It took a bit of discussion but we then realised how the top pulley is sprung. A 19mm socket and bar will push the pulley back so the belt can be slipped over it and the other pulleys. I knew this from taking the belt off in the morning but had somehow forgotten which bit to twist. If I’d gone back to my video it would have been obvious. Ted left again having provided his managerial skill and I tightened up all the bolts, torqued them, painted the joints and tidied up. 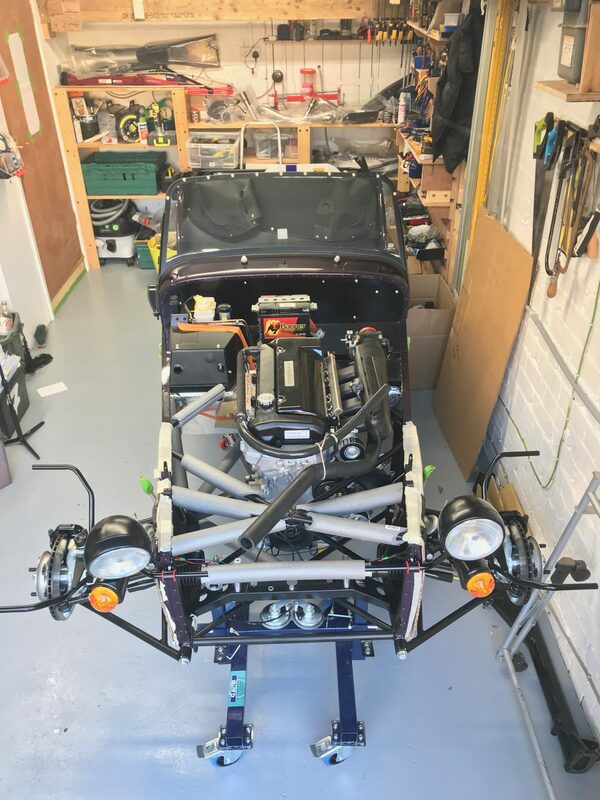 Once everything was tidy I rolled the car back into the garage and sat back in the glory of an engine united with its chassis! Ready to take the hoist back to Pete. Thanks Pete! I’m going to do a bit of man-maths here. On the project plan I said the engine install was going to take about 2 hours. In the end I was probably about right. It took about an hour to drop the engine in and an hour to prep the engine and then put the alternator back on and tighten up all the bolts. 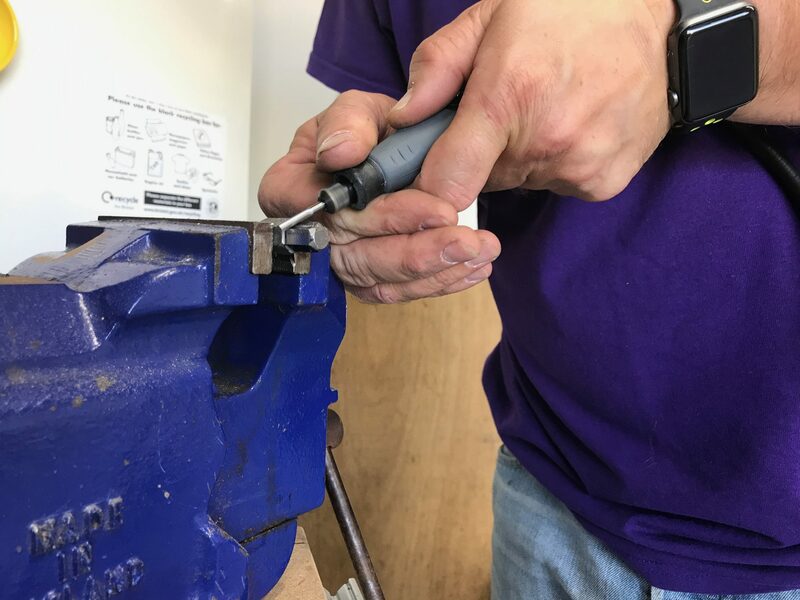 What I hadn’t accounted for was a significant amount of time getting the leveller figured out… the playing around to see if we could get the gearbox away from the tunnel wall and then making of a hex key. In the end we spent all day, which was 6 hours, on the engine install and associated tasks. It was quite a physical day too. Physical because of the continual jumping up and down between looking at the engine from above, checking it from underneath and jostling the jack, hoist and car backwards and forwards. I’m glad we had a whole day to complete this task. I’d hoped to finish it off much sooner but in the end we didn’t have to rush and we could make sure we didn’t damage anything in the process. 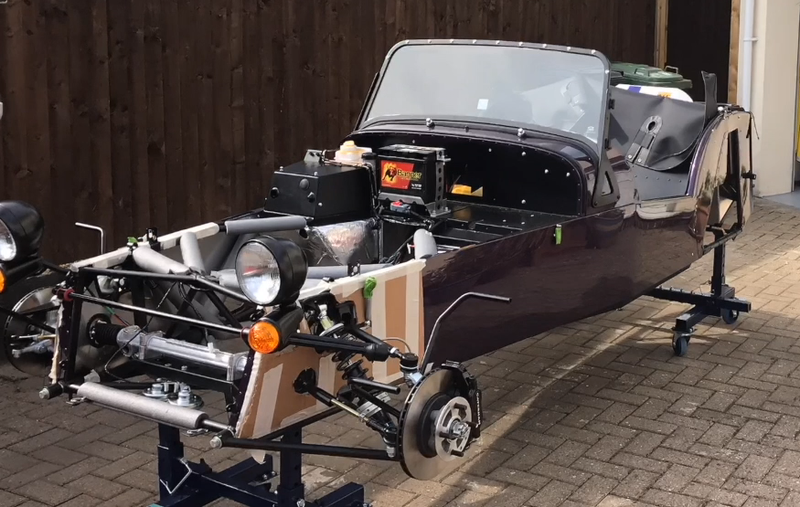 Back from a couple of days visiting family and had a few hours to get some prep done prior to putting the engine into the car tomorrow (Bank Holiday Monday). The manual calls for the top radiator hose to be fitted to the engine prior to it going into the car. I guess there’s not enough room to get it in once in the engine bay. However, in the “cooling” parts box, it didn’t seem to be obvious which of the hoses was the L-hose talked about in the manual. This hose, also called the top radiator hose later in the manual, is, in the end, much more complex than just an “L”. Once you get over the concept that you’re looking for an L-shaped object then there can only be one hose that works. And, once you offer it up to the engine you can see how it wraps around all the right bits and is contoured correctly for the install. You can then see that it has to pass under the air intake and would be tricky to install with the engine in the car. There is quite a bit of excess hose that pokes out from the front of the engine… looks like I’m going to need to remove 15cm or so once it’s finally in the car. Quite a bit of the top radiator hose poking out of the front of the engine. 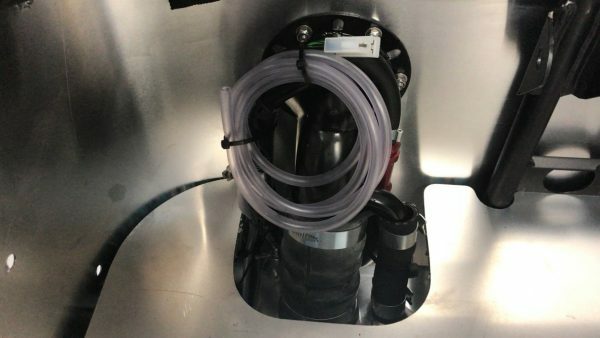 In this image its cable tied to an oil hose, which pulls the radiator hose to the left, it would normally come straight out from the front of the engine. The manual now tells you to fit the hose and of course use a jubilee clip. However, I had fun and games getting the jubilee clip on. The biggest clips you’re given are 40mm diameter, but I ran out of patience with that and pulled out some bigger ones I’d bought as spares. I may try and get a 40mm clip on at a later date. The next “prep” job is to attach the engine mounts to the chassis. They are two metalastic discs with two ears to bolt through the chassis. 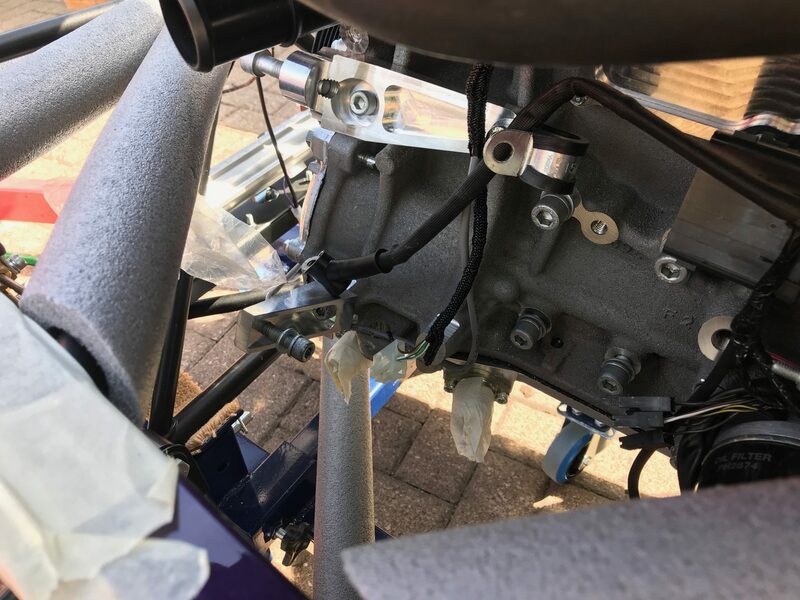 I test fitted the bolts through the centre holes just to make sure there wasn’t any “rubber” residue in the threads – much easier to sort that out when you don’t have a 200kg engine dangling above them (when they’re in the car). These may end up coming back out again as we put the engine in, but wanted to make sure I had everything sorted with them and the earth lead that attaches to the LHS mount. There are lots of stories about how little clearance there is when installing the engine, so I wasn’t sure if they would have to come out again to give room to manoeuvre at some point. On the LHS (N/S) engine mount there needs to be a good earth between the engine earth lead, bolt, engine mount and chassis. 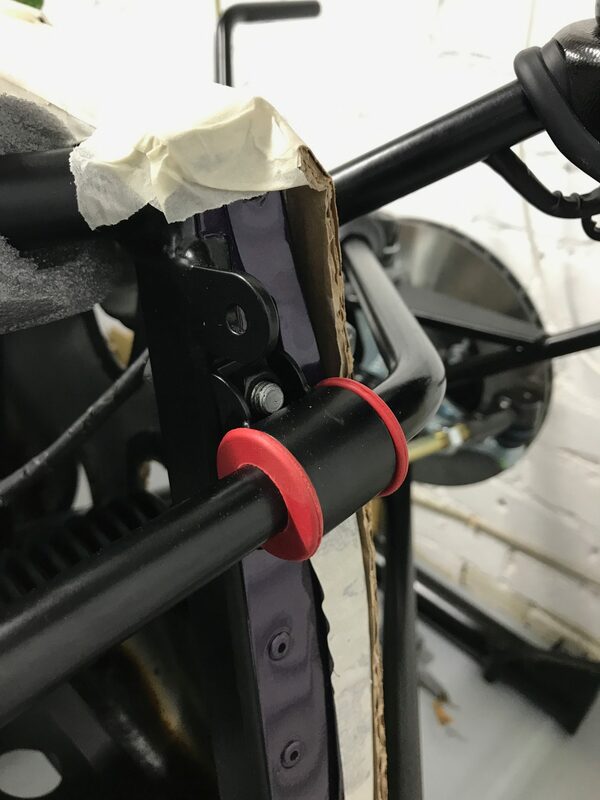 To make this happen you have to remove some of the powder coating of the chassis so the metalastic engine mount makes a good electrical contact with the chassis. Thinking this through some more as I write this, I don’t think there’s a lot of current passing through this connection. The biggest currents are going to be the cranking currents of the starter motor and I don’t think this engine mount will be the return path for that circuit. 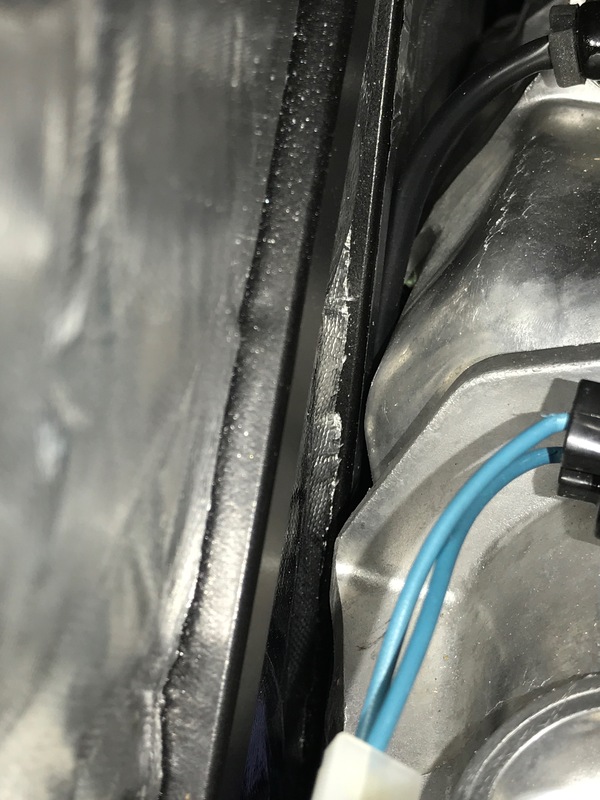 The starter motor grounds itself to the engine, and there’s an earth lead from the bell housing back to the battery that will therefore be the return path for the starter motor. If anything this mount is the return for the other electricals/electronics on the car. The same can be said for the alternator earth return, I don’t think it runs through the engine mount to chassis connection. Both will, of course, run through the bell housing to battery connection. 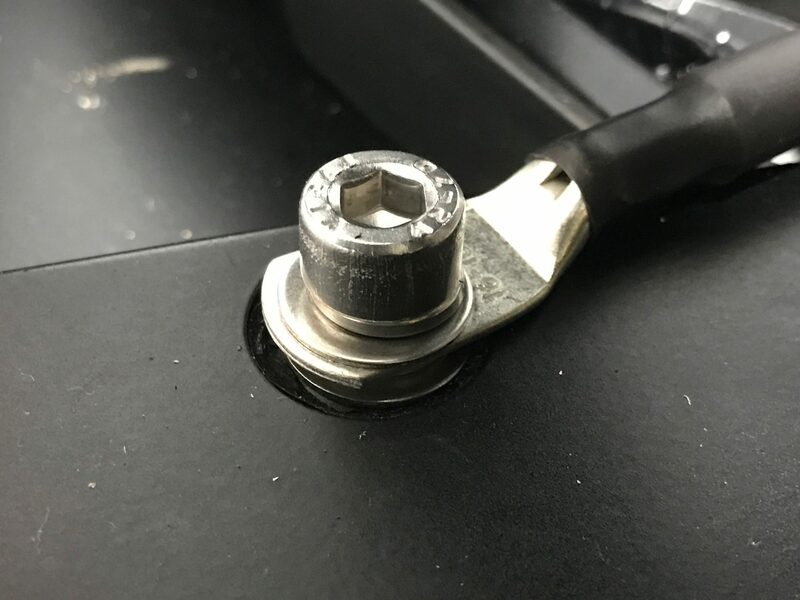 Battery to threaded insert on top of passenger footwell. 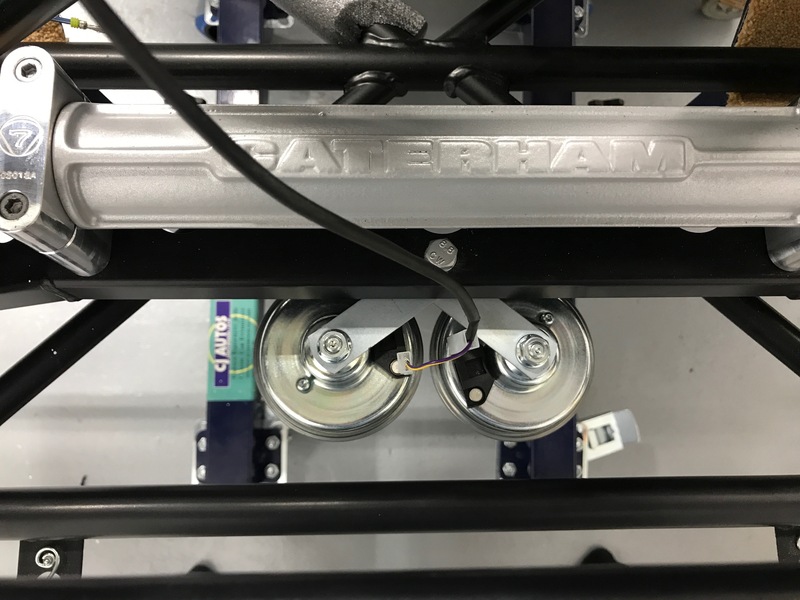 Looking some more at the passenger footwell connection: it looks as though Caterham have left one of the threaded chassis inserts un-plugged. These inserts mirror the inserts used to fix the pedal box on the RHS, so I’m guessing these inserts on the passenger footwell are for the left hand drive pedal box. Perhaps the additional earth on the passenger footwell is there because it reduces the number of connections for the path from battery to chassis – it’s one hop from the battery to the chassis with this additional connection but two hops from battery to bell housing through the engine and then to the engine mount connection. 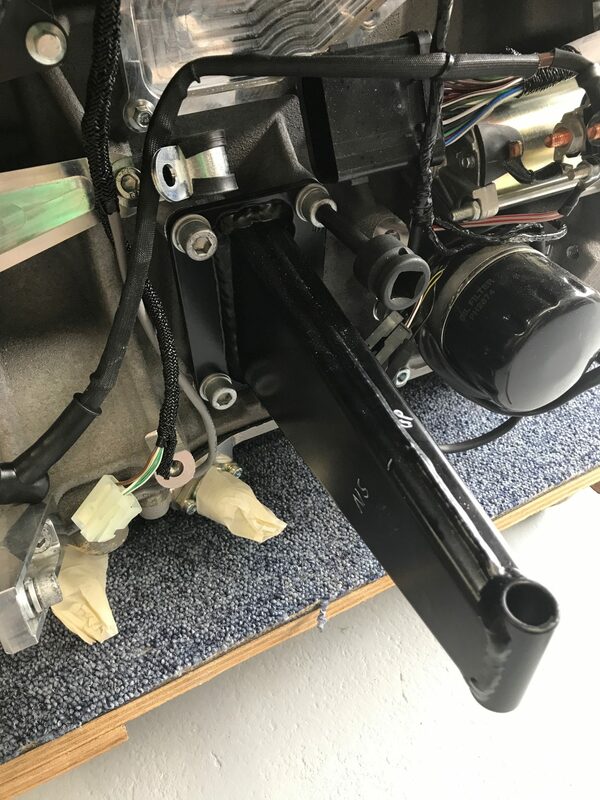 It may also be that people don’t do a good job of getting the engine mount connected electrically and the insert in the passenger footbox is a much more reliable electrical earth point – it’s also out of the way of the water and grime at the bottom of the engine bay. Having said all of that, with the two earth leads on now, the two main current sources/sinks, the alternator and starter motor respectively, will see a battery return path via both battery earth connections. They are essentially two very low impedance resistors… both very low impedance so they will practically share the current return to the battery. If Caterham were so concerned about the current load though then I think they’d have done more with the positive lead from the battery to the starter motor and alternator. 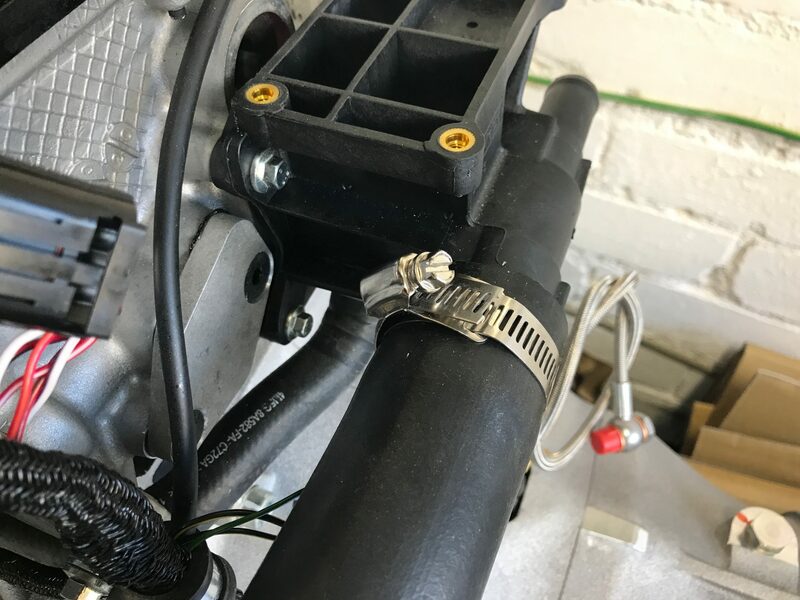 That has a much longer run on it, with the battery cutoff switch installed, and the gauge of wire used is not much more than I’ve seen in cheap jump leads that can get rather hot if pushed on big engines. I’ve certainly had cheap jump leads get hot on 3L and 5L BMW’s in the past… we’ll have to see if that causes a problem with this “little” 2L engine with long crank times. Hopefully that doesn’t happen very often, but I’m not counting my chickens just yet. Back to the engine mount though… Once I had the engine mount in and enough powder coat removed I tested the connection with a Multi-meter to check the ground. Once the engine goes in I’ll coat the engine mount and chassis with black hammerite to protect the exposed metal. At this point Harry and I popped round to Pete’s (our neighbour’s house) who had kindly left us access to his engine hoist. A quick trundle and the hoist was on our drive. Pete has modified his hoist for increased reach using a long extension bar (the black bar on the ground in the picture above). Harry and I played around with a couple of configurations but it looks as though we’re going to have to use the hoist in it’s extended long arm config, but with as short a throw as the longer arm will allow (there are multiple alignment holes for each configuration). 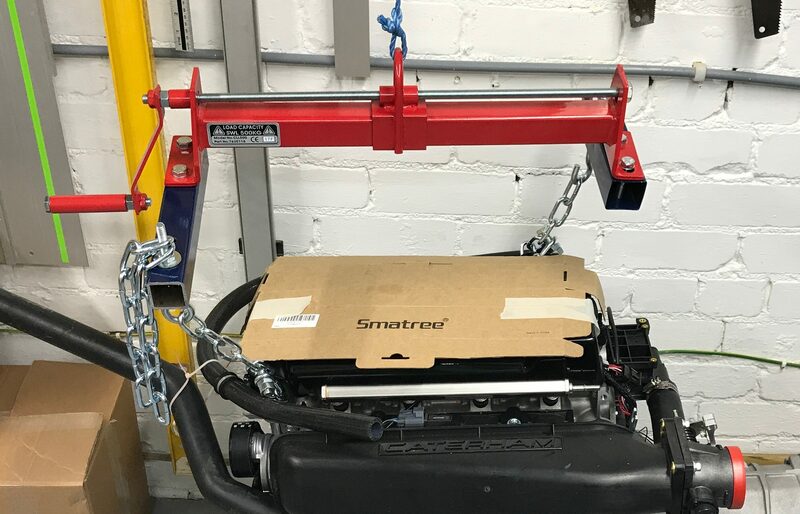 Engine hoist in short configuration – hmm, too short. 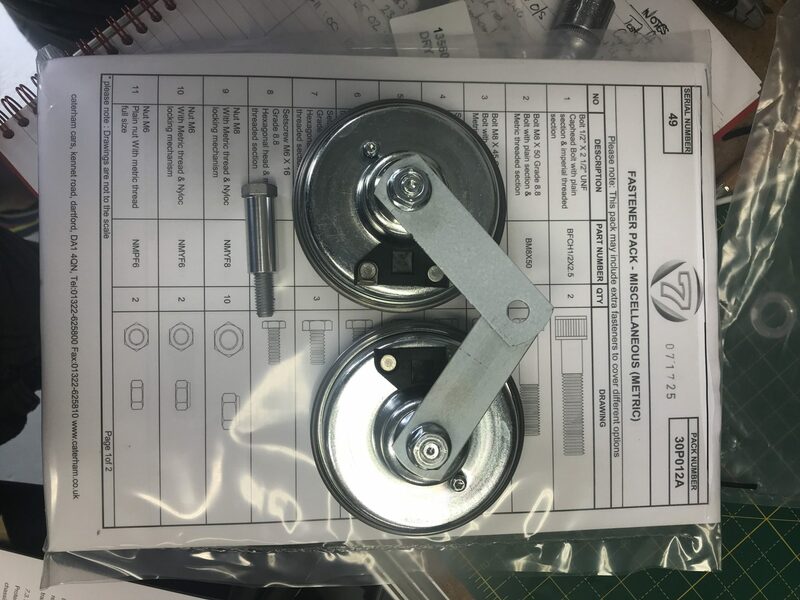 Engine hoist in long configuration – uh-oh! Over-balanced! I’m concerned that the hoist will tip with the duratec engine and gearbox on it. You can see from the picture above that the chain and hook extend past the end of the hoist wheels – a recipe for disaster! 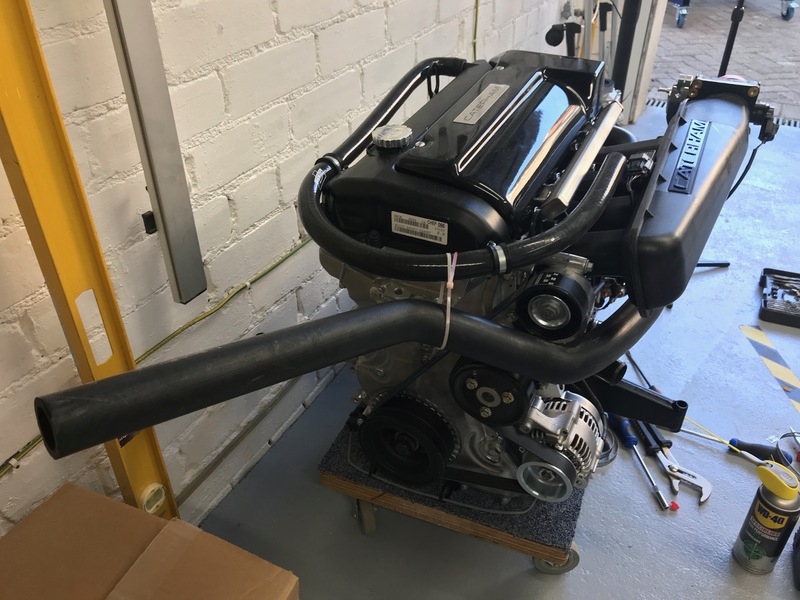 I’ve done some research and it looks as though the engine and gearbox should be somewhere between 120 and 150Kg… I’m sure we can find some way to counter-balance the engine and stop any tips – a few bags of sand should do the trick. We then got out the load leveller that I’d purchased a few weeks ago. It’s a simple screw thread that shifts the engine around its centre of gravity. We’ve yet to try it in anger but it looks as though it will do the job. One issue with any hoist arrangement with this engine is that the engine lifting points are at diagonally opposite corners of the engine. 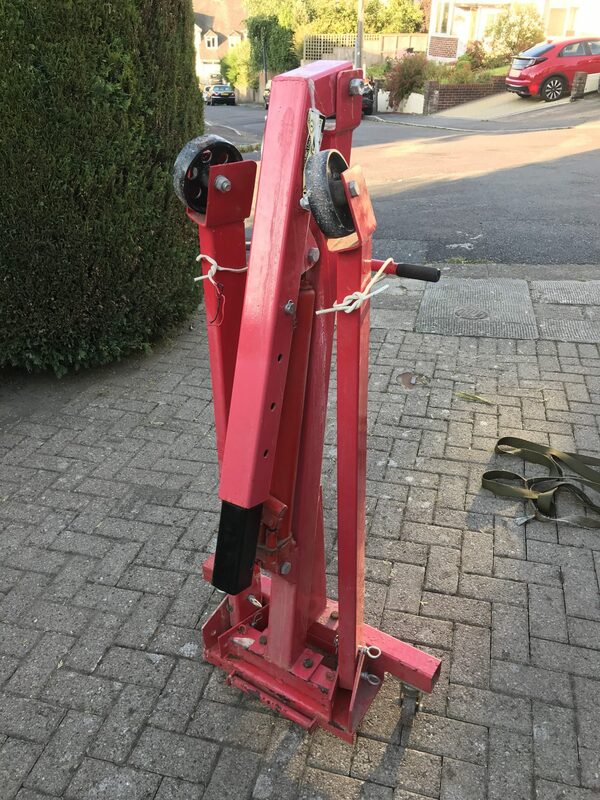 Therefore, if you either strap it to a hoist or use something like a load leveller you will find that as you tilt the engine it tilts on the axis of the lifting points. i.e. it doesn’t tilt along the axis of the engine and gearbox assembly, it twists to one side. To counteract this I thought that outriggers on the load leveller would allow me to attach the hoist straight up and down the axis of the engine, so counteracting the tendency to tilt non-axially. I took some of the box section I’d cut off of the CJ Autos wheeled axle stands and fashioned some extensions. I drilled holes in the box section to attach to the leveller and then holes at the end of the box section to take the hooks of the leveller. On setting up the leveller for the first time it was clear that the outriggers were not quite long enough and therefore not able to counteract the full non-axial tilt. I only had a certain length of box section and so had to make them as long as I could, but perhaps that’s not enough. As you can see from the image below, the leveller sits more true to the line of the engine, but not quite perfectly so. Leveller sits more in line with the engine but not quite perfectly so. The rear chain is a little slack here too. So, on with the engine install tomorrow. 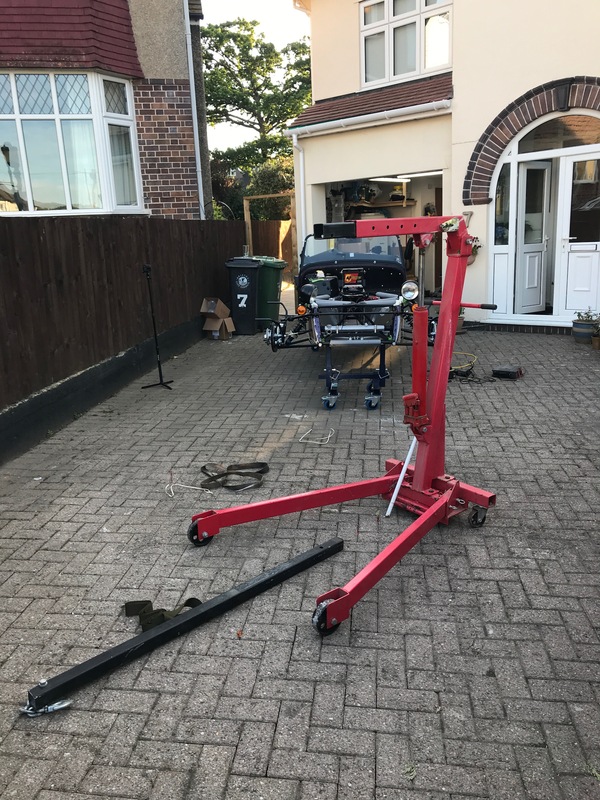 The weather is set to be good and so we’ll do the install outside on the driveway… another example of where the rolling axel stands are paying off. We were heading out on a family trip this weekend so I had just a couple of hours in the morning this morning to look at two jobs that I’d hoped to finish earlier in the week. There’s an explanation of the Washer Bottle story in the Email 4 : Washer Bottle in the Boot post. Once the regular day had started I wanted to get two jobs done: The Front Anti Roll Bar and the Horns. The front ARB connects the two upper wishbones together with a (nominal) 15.5 mm bar, shaped vaguely in a U shape. The front ARB I have seems to be slightly oval – it’s ~15mm in the vertical dimension and ~16mm in the horizontal. 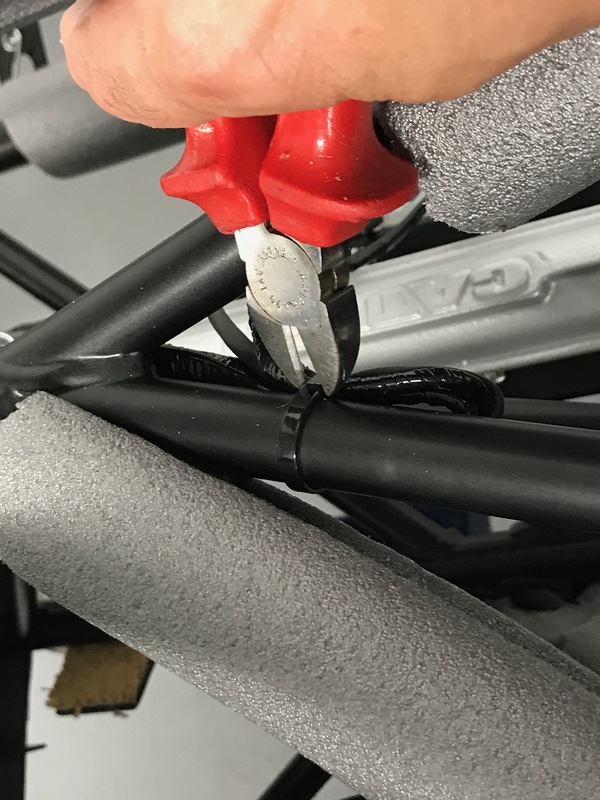 There are threaded sections on each end that take plastic balls that fit into sockets on the upper wishbones. 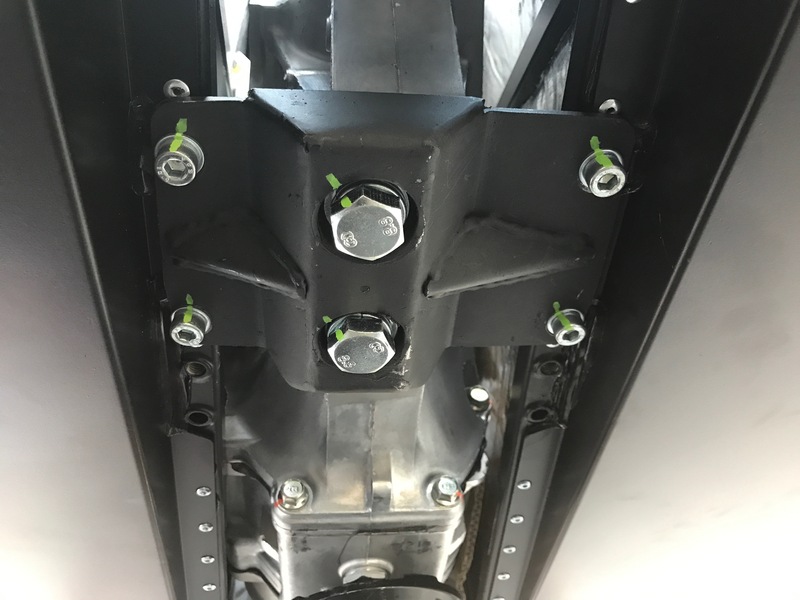 The middle section of the ARB is held in by two “rubber” bushes that fix the ARB to the front of the chassis via circular clamps. I’ve discussed the conundrum I’d had regarding what colour bushes to use for the ARB (it’s the red ones for the front ARB) in a previous post, Email Derek 2 : ARB Bush Colour and the Red Dot. Red front ARB bushes inserted into their clamps. Note I’m using WD-40 PTFE lubricant. .. and then onto the ARB, also, with relative ease. They need a bit of a shove to get them around the approx. 45 degree-ish corners on the ARB but essentially no problem. 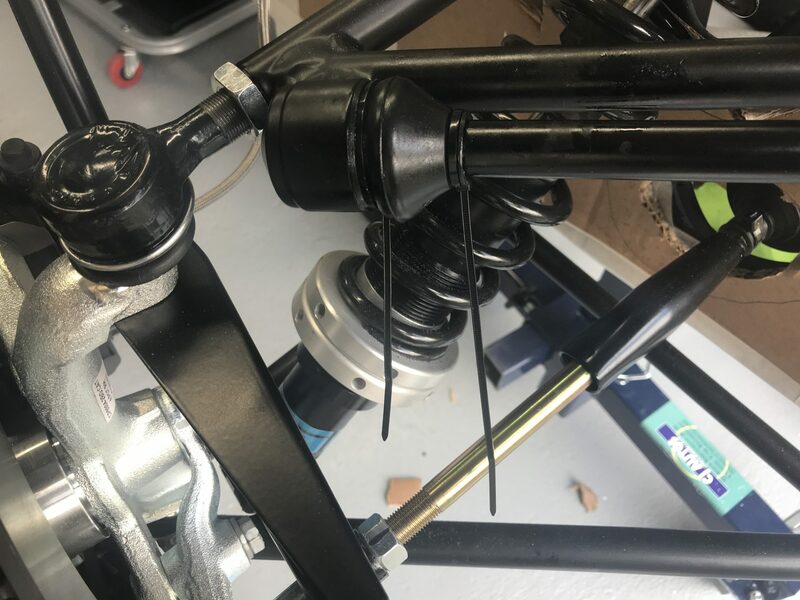 Once you have the bushes and clamps on the ARB you can add the boots that ultimately cover the joints to the upper wishbones and then screw on the ball ends with Locktight applied. Where the problems did start were with the balls on the end of the ARB and getting them into their upper wishbone sockets. I applied Locktight to the threads of the ARB and screwed on the ball ends. I greased the sockets and the balls. 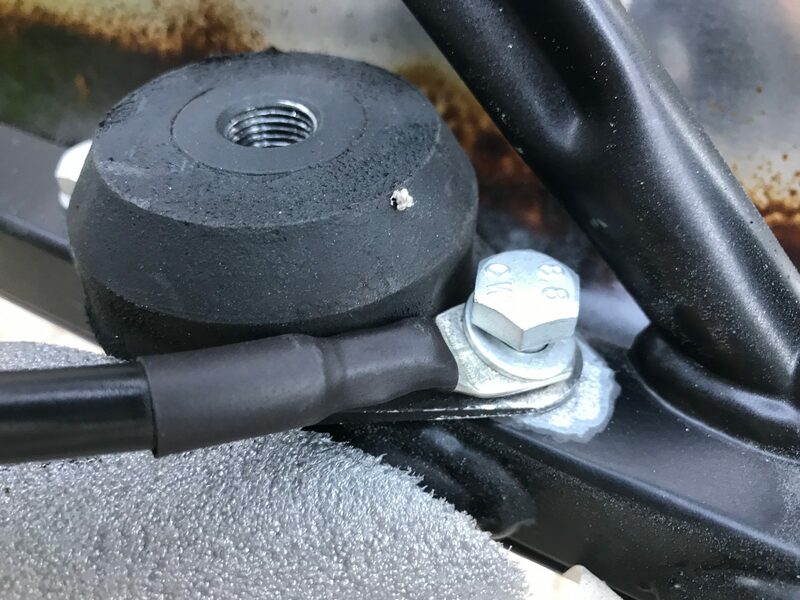 The ARB was then offered up to the wishbone sockets but the balls essentially just sat on the perimeter of the socket and didn’t drop into them as I thought they should. A quick google and it seems others had similar problems, but, as I expected the ARB should sit in the sockets not on them. 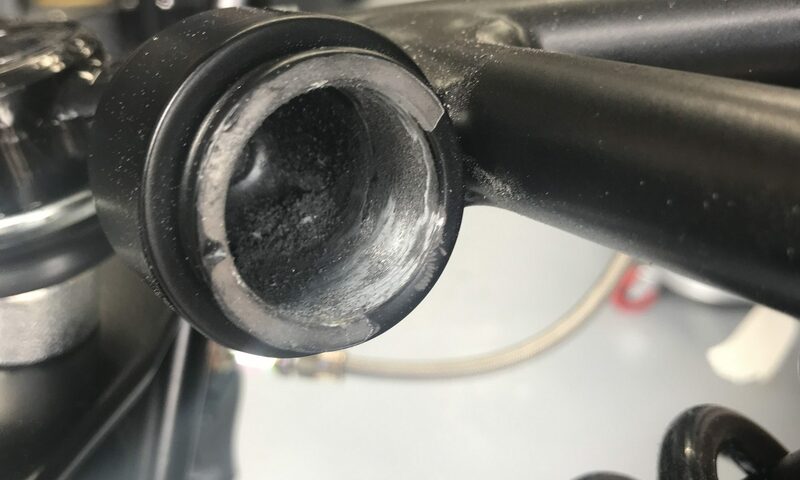 Some suggested that you need to clear the sockets of some powder coat and that should do the trick. 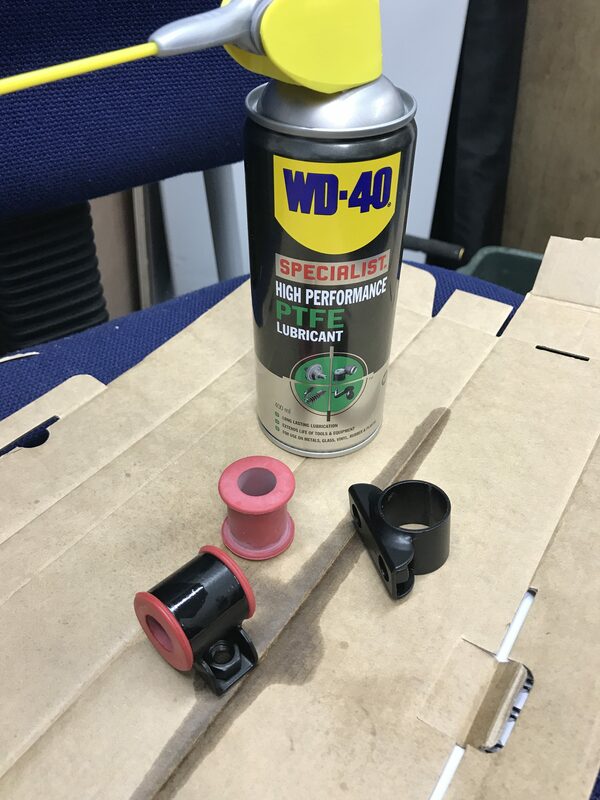 There were also suggestions that you can get a hydraulic seal if you use too much grease, but it didn’t feel like that sort of a problem…. it was a mechanical block that was stopping the ball entering the socket. I also noticed that the balls on the end of the ARB were not moulded perfectly round. They looked to be a two part mould and the two hemispheres didn’t quite line up. So, out with the dremel and the dremel flexible drive and I ran around the insides of the wishbone sockets. While I was at it I also trimmed some of the excess off the non-aligned hemispheres to see if that would help too. 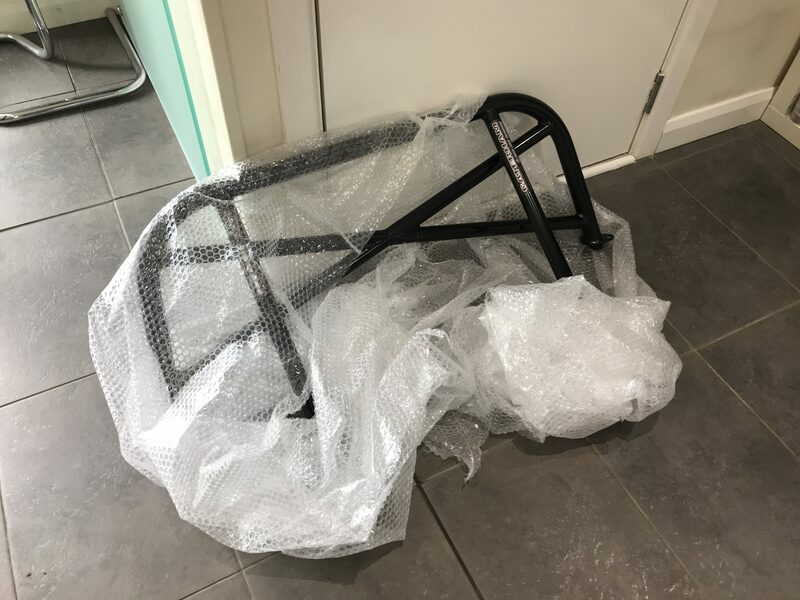 Upper wishbone ARB excess with powder coat removed. 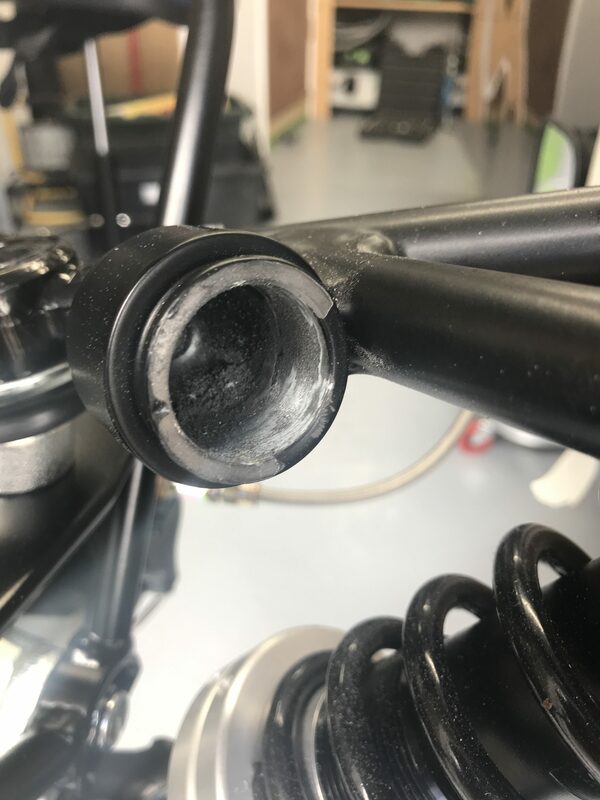 Other’s had commented, and I agree, that there’s not much threat of corrosion on the upper wishbones after the power coat is removed… because the ARB ends are covered with a boot that encloses the open end of the wishbone socket and the ARB ball. Front ARB inserted into upper wishbone and boot covering the joint. Just need to snip off the ends of the cable-ties. Once I’d fettled the sockets and the plastic balls, the ARB dropped into the sockets with no problem. In fact they might have been a little bit loose. I came to the conclusion that this probably wouldn’t be a problem seeing as the whole thing was under quite a lot of tension. Even though the balls dropped in with no resistance the whole ARB needed to be put under tension to get it fitted. So the ARB ball ends sat in the sockets tightly. As the ARB does its job the balls and bushes need to be free to move. I think that’s exactly how I think I’ve left it. Last job here was to attach the clamps that surround the bushes to the front of the chassis and to torque them up. Simple job took a couple of minutes. In all the front ARB probably took 45 minutes to get attached. On the 420R the horns have to sit in a different position than normal. You have to drill a hole in the steering rack cross member and mount them below it. It’s also recommended that you undo the nuts holding the horn to its bracket and rotate the brackets. This is so that the horn electrical connections are close enough together to get the wire from the electrical loom onto them. The first job was therefore to undo the nut holding to horn to its bracket. Others have recommended a breaker bar be used because the bracket nuts are quite tightly screwed onto the horn. 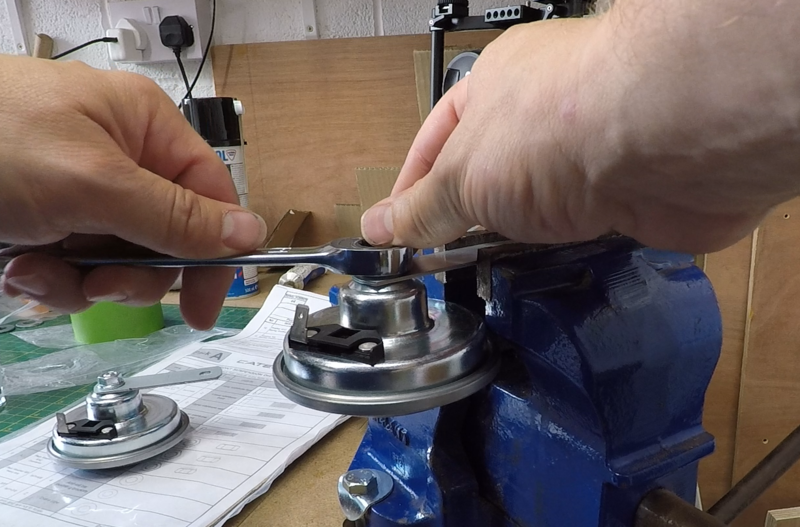 My solution was to use a vice – simples. 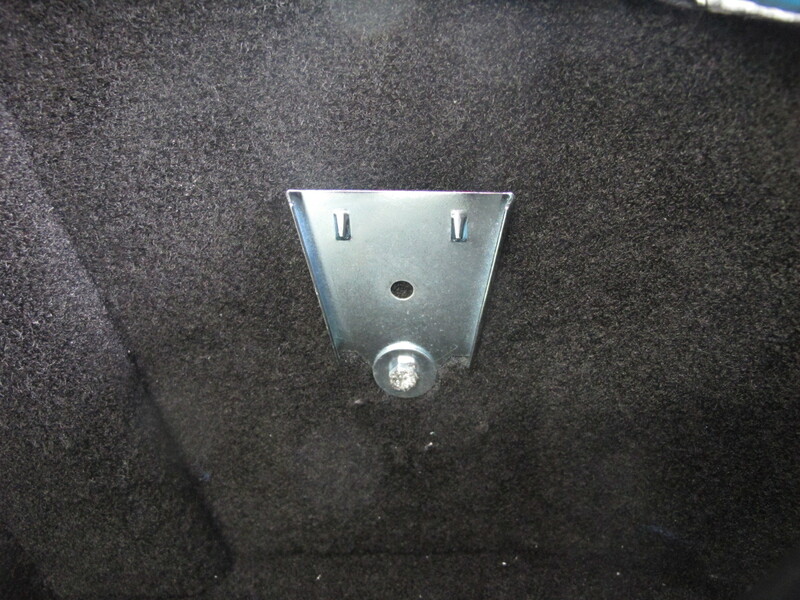 The horn brackets can then be rotated to bring the electrical terminals closer together. 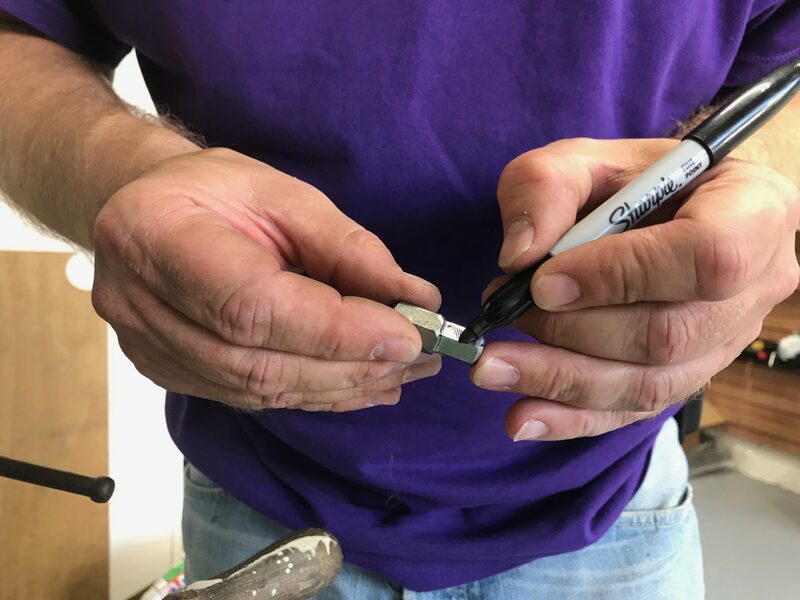 It was then a case of drilling an 8mm hole in the steering rack cross member and attaching the two horns with the an M8 bolt, spacer and spring washer. There seemed to be a couple of options for fitting the wiring to the horns. There are two sets of wires with two spade connectors that seemingly could be used: one with a single wire that’s looped from one connector to the other and a second set of wires that have what look to be separate feeds coming to the two connectors. It clearly had to be the single-looped set of wires – one of which is yellow/purple. However, those wires don’t reach from the loom to the spade connectors on the horns – they’re not long enough on my loom because there’s a cable tie used to hold these wires to the chassis as the wires double back for strain relief. I decided to snip the cable tie that holds all these wires, and the loom, to the upper chassis rail. If I removed the cable tie then the purple/yellow cable would reach. It seemed sensible to re-attach a cable tie to the remaining wires so they were secure and the job was done. That was the two jobs completed for the day. Off to see the family and then thinking about doing the engine install on Monday (August bank holiday Monday – a public holiday in the UK). Couldn’t sleep so thought I’d look at the washer bottle and get a sense of what needed to be done. The build manual talks about fitting the washer bottle in the engine bay. I’d seen the 420R at Williams a few weeks earlier with it mounted on the N/S top chassis member – or at least a bracket that’s just below there. 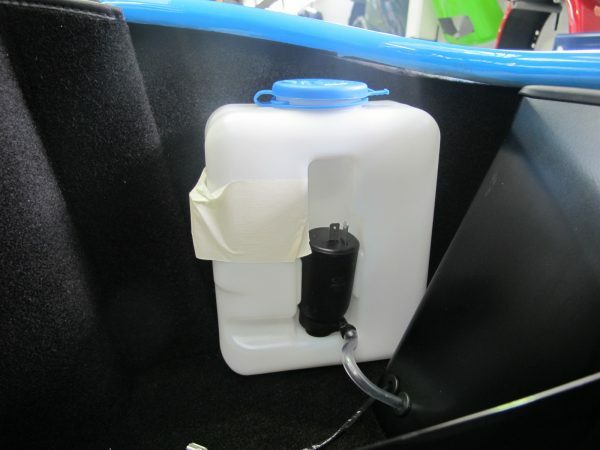 Sigma engined cars have the washer bottle located on the outside of the passenger compartment – in the engine bay. This looks like a good position but with the Duratec engine I have, there isn’t enough room down there. 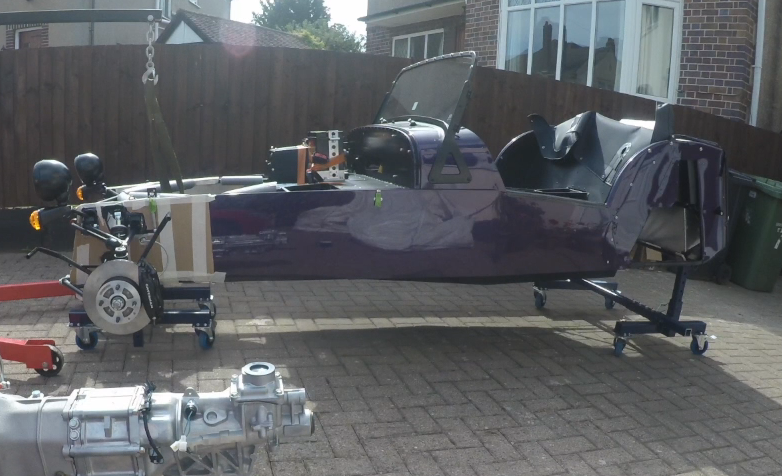 Now… there’s an argument that says – “who needs a washer bottle in a Caterham 7? You’re only going to be driving it on sunny days”. And I can see where someone might be coming from with that view. However, I’m hoping to drive the car all year round and it seems to me that a washer bottle that I can make sure is reasonably full is going to be a good idea. So.. at 2:40AM I started to look at how I should be fitting the washer bottle. Of course I re-read the manual and had a look at a couple of blogs. Seemed I was going to have to fit it in the engine bay where I saw the 420R at Williams had it. Then I started to trace the route of the washer pipework from the nozzle on the scuttle, below the windscreen. It goes down, then it goes back. Hmmm… it goes back. 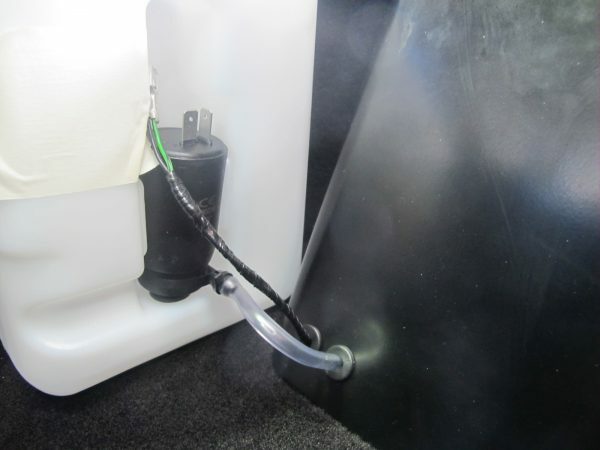 It goes back all the way to the boot and next to the fuel filler pipe there’s a coil of plastic piping that’s ultimately connected to the nozzle up front. Washer bottle pipe coiled in boot and attached to full filler pipe. I’d spotted that there was a coil of plastic pipe in the boot but I thought it was someone being over exuberant with something to do with a breather pipe from somewhere. Note to self… I really aught to spend more time just poking around the car and working out what stuff is and what it might be for. Ok, so it looks like the washer bottle now sits in the boot. 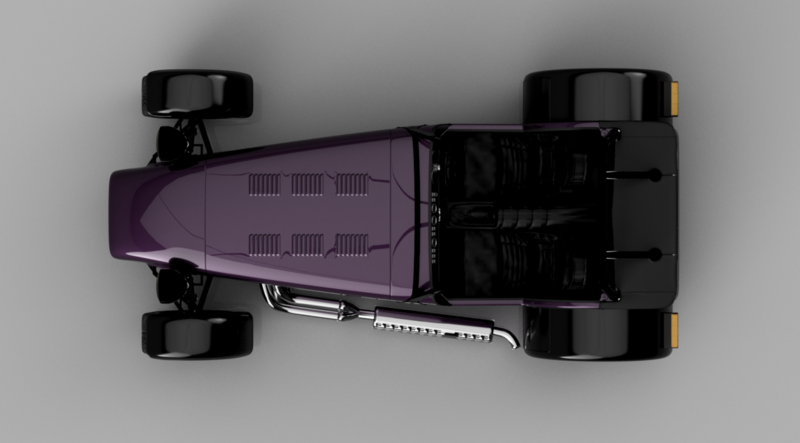 I went back to the Lotus7.club Blatchat pages and did some specific searches for washer bottle and boot. There was one post from earlier in 2017 and someone responding to say that their factory build 620 had the washer bottle in the boot. They had kindly included some pictures and I could see it was mounted on the off side body work somehow. Looks like Caterham are now fitting the washer bottle inside the boot space and not in the engine bay. Seems like a much better idea. Any suggestions or photos showing where, and how, a good mounting place would be? 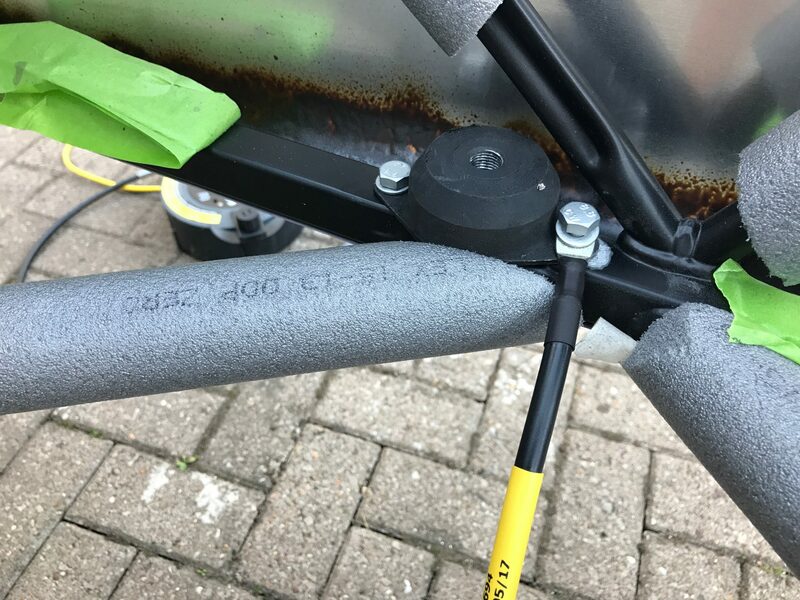 Some text in one of the Blatchat posts also talks about using one of the rear wing mounting holes as one of the fixing points for the washer bottle. I’ll explore that when I get closer to the boot – remember, the build is essentially a process of working from the front of the car backwards. So the boot, and now washer bottle, will come later. 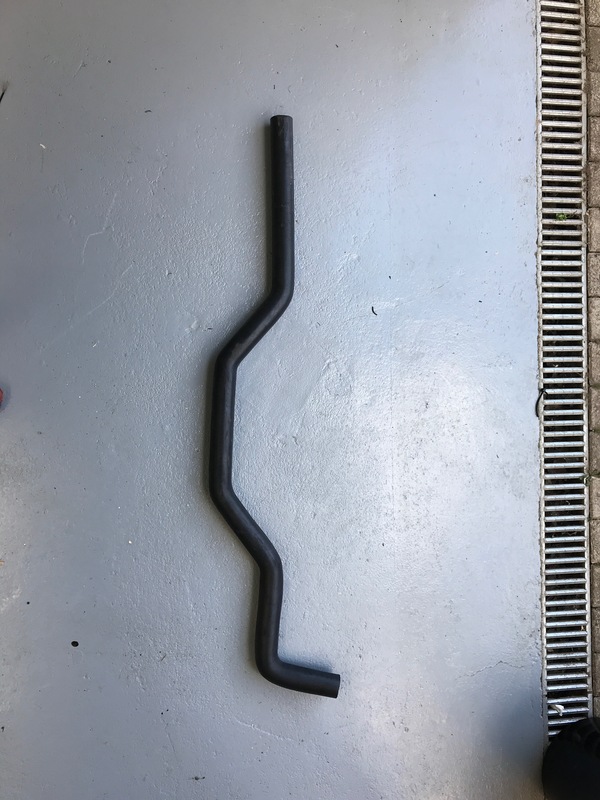 Nick from Williams called today to say that the track rollover-bar, that I’d ordered, had arrived. So, in between meetings I popped over to the showroom to pick it up. 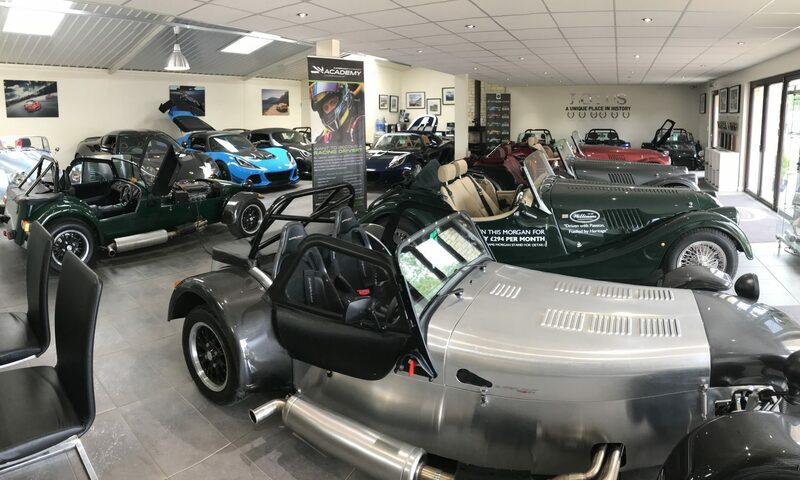 While I was there I took the opportunity to look over a couple of Caterhams one of which had the bonnet removed. 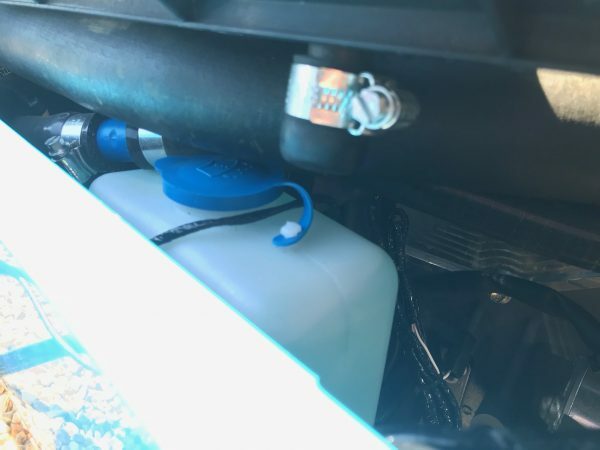 I was interested in where the washer bottle was located (along with checking the steps I’d already completed like he front suspension)… it was on the lower end of the passenger footwell where I’d seen others placed. That was in contrast to where I had seen one placed on a 420R a few weeks earlier, which was on the N/S top chassis rail (almost impossible to fill from there). But more on washer bottles in a later post. I had a chat with both Nick and Paul (the sales manager) about IVA (Individual Vehicle Approval). I’m starting to think about how I’m going to get this car tested. Williams can do the Post Build Check (PBC) but not transport the car to/from IVA or do the paperwork. I’ll need to ring the local IVA test centre in Avonmouth and find out what sort of wait time there is for a test at the moment.